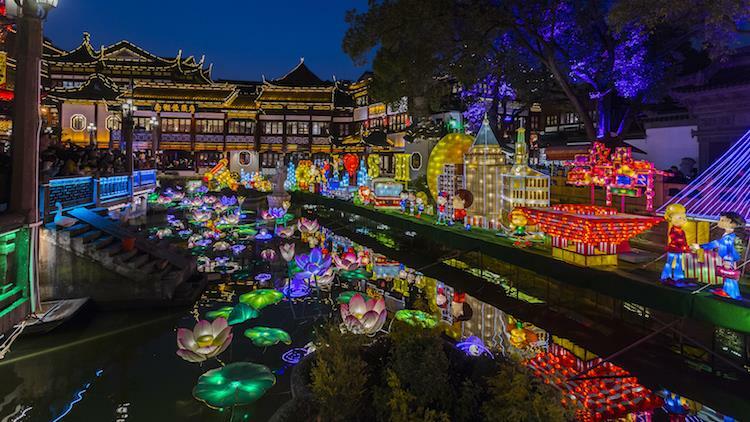 See Yu Garden lit up for the Year of the Pig at the 24th annual festival where the area is decked out with huge displays of brightly coloured lanterns. Be prepared to face the crowds. Entry is free except February 15-19, when tickets are needed through the run up to Lantern Festival (Tue 19). The pricing is a little complicated, so here goes: from Friday 15 to Monday 18 it's 50RMB for adults and 30RMB for kids (tickets available from 4-10.30pm Fri 15 and Mon 18; 2-11pm Sat 16-Sun 17); on Tuesday 19 tickets are 80RMB adults and 50RMB kids (tickets available from 2-11pm). Tickets are available online and near Yuyuan (there's a ticket booth opposite Yuyuan Gate). Lights will be turned on from 5.30pm every day, except Feb 4 for chuxi (Chinese New Year's Eve). Closing times: Jan 21-Feb 3 and Feb 11-14 lights go off at 9pm; Feb 5-10 lights go off at 10pm; Feb 15 and Feb 18 lights go off at 11pm; Feb 16-19, lights go off at 11.30pm.